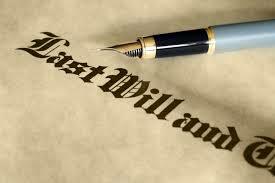 A Will is a legal document that outlines how you want your estate to be distributed when you die. When there is no Will doubts and difficulties arise simply because there is no evidence of the deceased person’s wishes. 2) Why is it important that I have a Will? If you die without a Will you don’t have any say about how your estate is distributed. The term ‘dying intestate’ occurs when a person dies without a will. According to the rules of ‘intestacy’ in this situation the estate will be distributed to the deceased’s relatives. This may be very different from what you wanted (or intended to happen). Dying ‘intestate’ can also cause complications, delays and extra costs for those you leave behind. What’s more, if you die intestate and you don’t have any relatives closer than a first cousin, your estate will go to the government. 3)Who can make a Will? Anyone over 18 can make a will as long as they have mental capacity. If there is any doubt over the will makers’ ability to make a Will, an assessment of their legal capacity needs to be made by an appropriate person, such as a doctor, psychologist or psychiatrist. 4)How do I make a Will? Making a Will can be a simple process although this depends a lot on your personal circumstances. Most people think they are ‘uncomplicated’ although this is increasingly rare. Lawyers skilled in estate planning are best situated to offer advice about what kind of estate plan will meet your needs and personal circumstances best. 5)Can I use a DIY Will Kit? You can and these kits are a ‘cheap’ option. However, these kinds of Wills (along with those prepared online) carry many risks. The most common risk (and we see this too often), is that the DIY is incorrectly executed and is consequently deemed invalid. Essentially, if this happens you die intestate and the rules of intestacy apply. Your wishes may well be ignored and the whole distribution of your estate can be a long, drawn out and costly experience for your beneficiaries. Of course, DIY Wills don’t come with the reassurance that seeing an expert offers. Estate specialists will work in conjunction with tax professionals and they will also advise you on any tax issues you need to take into account when drafting your will. 6)How long will my Will last? Your Will lasts until you die, unless you change it, make a new one or revoke (cancel) it. It is important to be aware that a marriage will also revoke a Will (unless the will was made anticipating that particular marriage). On the other flip side, if you have separated or have recently divorced, you need to update your Will. Failure to do so may well result in your former spouse benefiting from your estate even after you have undertaken a property settlement. 7)Who should be appointed as my executor? The executor is the person named in your Will who will be responsible for dealing with your estate after you die. This person needs to be over 18. Ensure that they are trustworthy and are prepared to take on this responsibility. If you wish, a professional such as a solicitor, can be appointed for the job. 8)Where is the Will kept? Most solicitors will keep the original Will in safe custody for a client for no charge. We even have special fire safes designed just for this purpose. This is the safest option because if a Will disappears it is assumed that the testator tore it up for the purposes of revoking it. If you do decide to take it with you, we recommend it is kept in a safety deposit box in a bank, or in a safe place at home. It is a good idea to keep a signed ‘copy’ with your personal papers, along with a note explaining where the original Will is. Furthermore, it is a good idea to advise your executor where the original Will is. 9)Can I change my Will? Your Will can be changed at any time as long as you have mental capacity. It is important to note that you cannot change your will by crossing out something in your Will and initialling it, or writing something different in its place. To do so may cause your entire Will to be invalidated; or, at the very least, may mean that the change is invalidated. 10)Can my Will be challenged? While all Wills are at risk of being challenged, most commonly a Will is challenged on the grounds that it is not valid. DIY Wills, because of issues related to their execution, are most vulnerable to this. The will maker was forced or influenced into making the Will. Certain categories of people (mostly family) can also contest a Will if they believe they weren’t properly provided for in the Will. This is called a ‘family provision claim. Having your will made by a solicitor will lessen the chance of a successful claim occurring.